Hello, dear readers- welcome! Come in, do and have a seat. What? You feel it’s a bit hot in here? Ah, I think I know why. 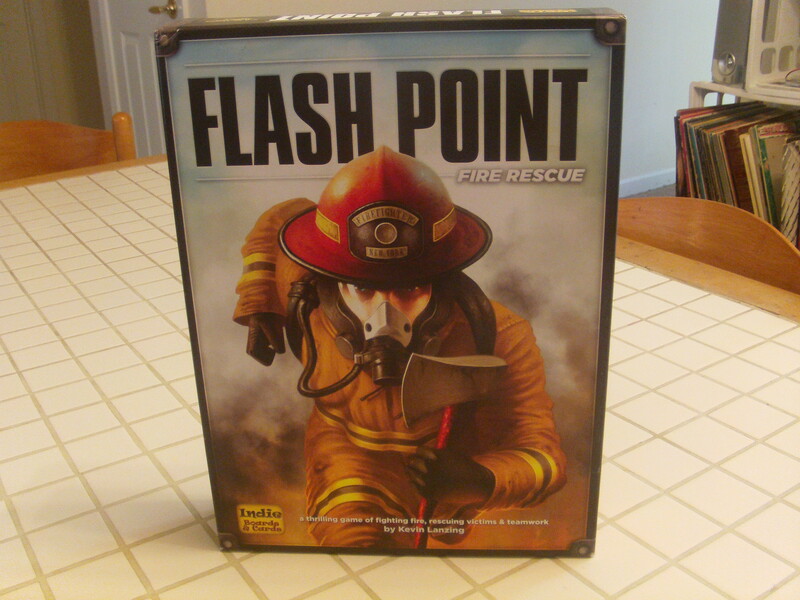 It’s all because of the blistering little package I have to review for you this week, Flash Point. This is a fiery little gem brought to us by designer Kevin Lanzing and published by Indie Boards and Cards. 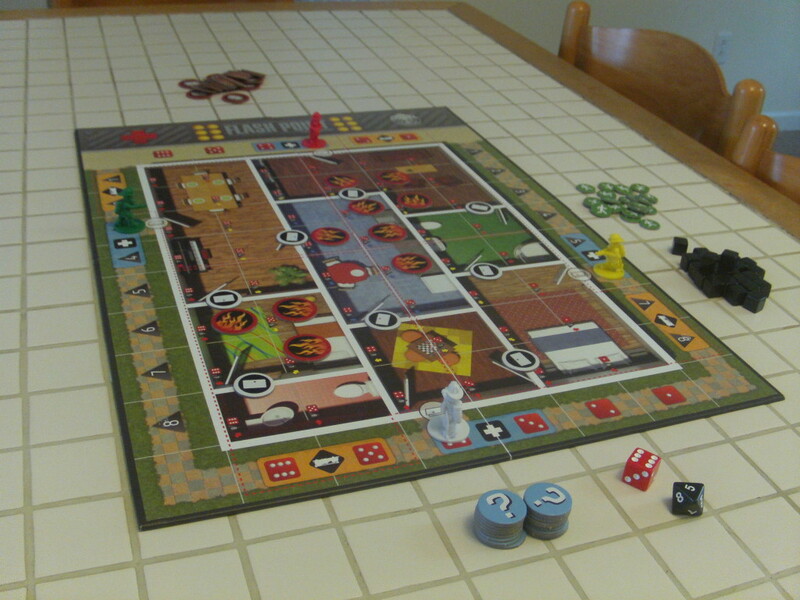 It’s a cooperative firefighting game for 2-6 players with games lasting on average 45 minutes. Who knew that such a simple setup could inspire such blistering terror? But before you think this is going to be a comfortable snooze beneath the heated blanket that is cooperative gaming, I must warn you. There are deadly stakes involved in this deceptively simple game. 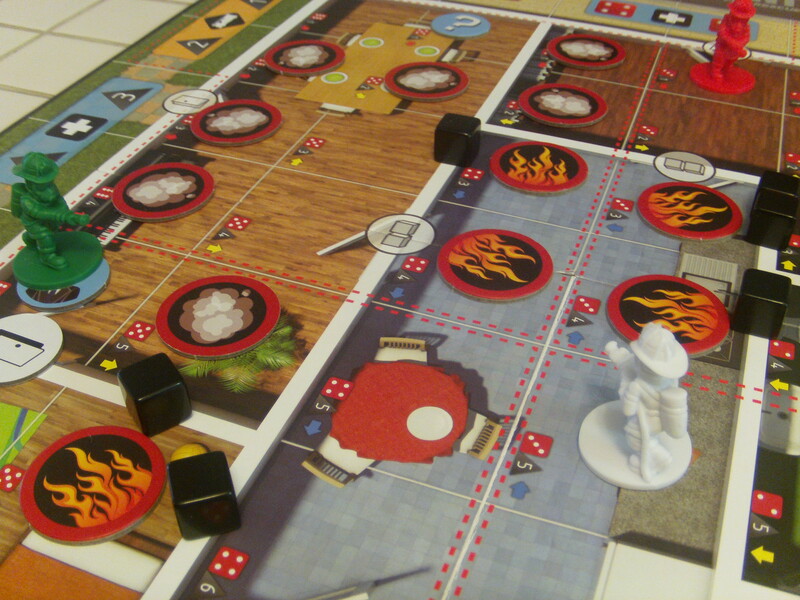 Each game the board is set up and the players respond to a fire alarm in an average, banal, suburban home. 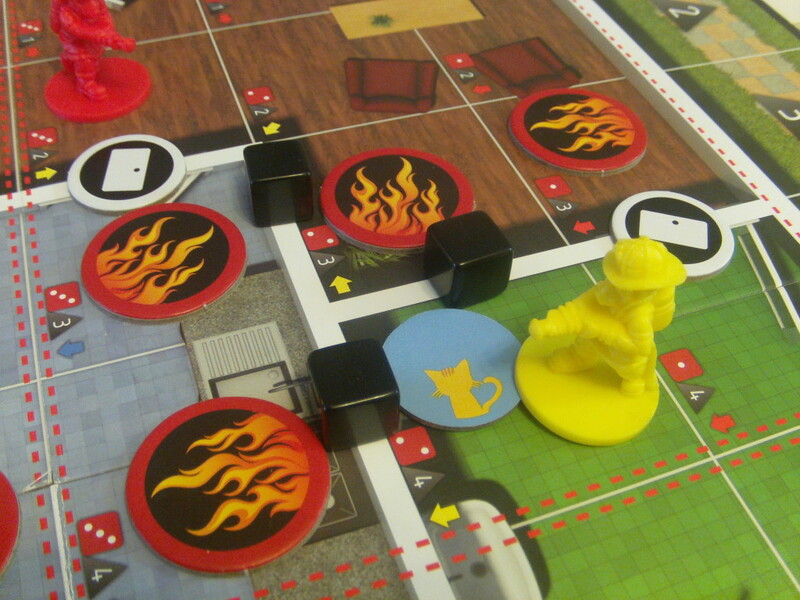 Fire tiles are placed, along with tokens displaying question marks (known as Points of Interest or POI) showing the location of possible people (or pets) in peril. Your task is simple: rescue seven victims before either the house collapses from damage or four victims succumb to flames. Sounds pretty simple, right? No, I don’t smell any smoke. I’ll save you, Mr. Mittens! On your turn you have four Action Points (or AP) to spend to do any number of actions (such as moving from one square to another, extinguishing fire or smoke, opening and closing doors, carrying victims, etc.) with any unspent AP holding over until your next turn (with the maximum total AP in a round being eight). Once you take your actions, you then roll the red six-sided die and the black eight-sided die to determine how the fire will spread. These two dice will give you a specific square to add a smoke counter to. 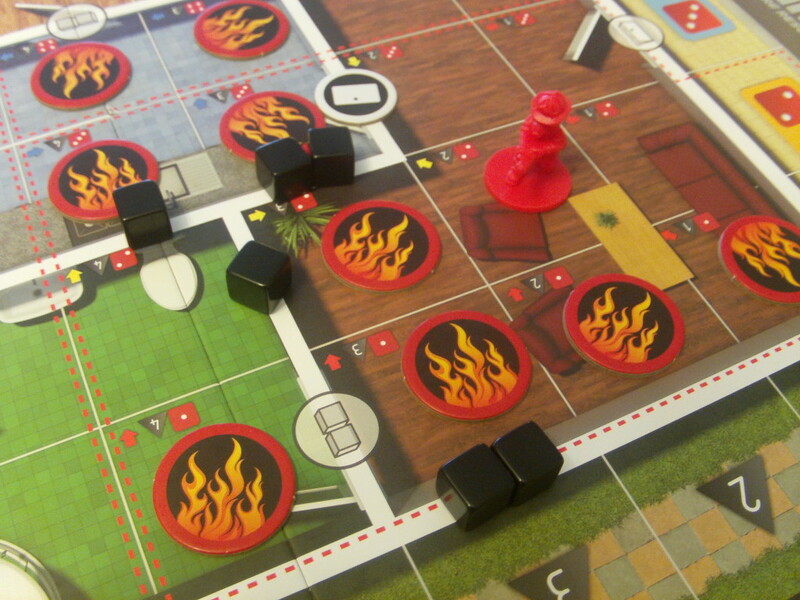 At the end of someone’s turn, any smoke counters on squares next to fire counters turn into fire. What’s more, if you are required to place a smoke counter on an already existing smoke counter, it turns into fire. Even further, if you are required to place a smoke counter on a square containing fire, it causes an explosion which can damage walls, blow doors off their hinges and spread the fire even further. As you can see, what starts out as a small, reasonable fire quickly can turn into a monstrous inferno in the span of just a few players’ turns. Huh, that’s funny- the paint seems to be crackling right off the walls. Anyway, damaged caused to the walls by explosions or the chopping of firemen’s axes is a big problem. Any segment of wall that is damaged receives a small, ominously black cube. Two cubes on a segment signify a hole through which firemen may travel or fire may spread. But you only have a limited amount of cubes in this game. Too much damage means the structural integrity of the house itself is at risk. Run out of cubes and the house becomes unstable- it collapses and kills everyone inside. Surprise, surprise, this means you lose the game. Further complicating matters are those little POI tokens. Get your firefighter to a square containing one and you get to flip it over revealing a victim to save or a blank token. That’s right, rescuing victims from a blazing inferno can be quite disorienting- sometime you get to a room only to find that those cries for help you heard were coming from somewhere else in the house. Oh, don’t mind that stain on my shoulder, it’s just my earwax, which has apparently melted out my ears. The thing is, what I’ve just described to you- that is the beginner’s version of the game (what the manual calls the “Family Game”.) 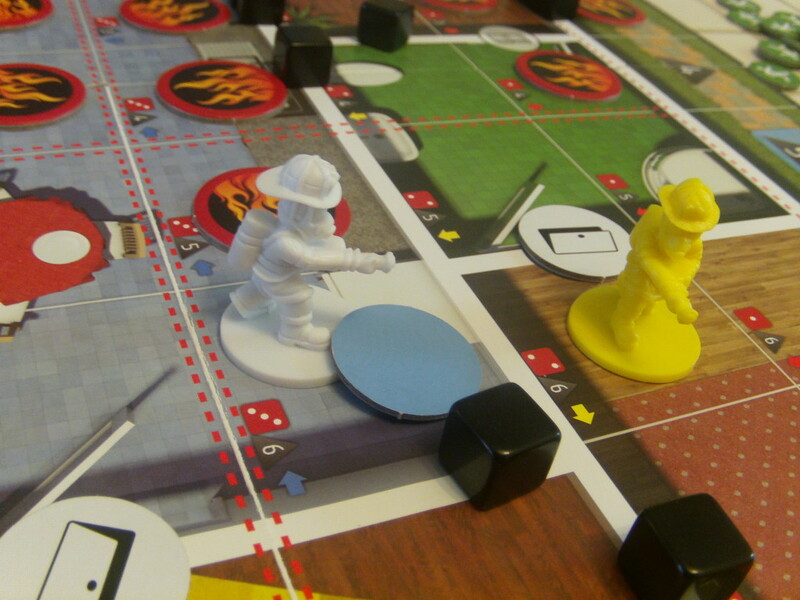 The “Experienced Game” adds a plethora of features to further flummox the average firefighter. There’s a more difficult house on the flipside of the board, firefighters are assigned roles with specialized skills along with a Firetruck and Ambulance token to add to the board. What’s more, there are explosive Hazardous Materials to deal with along with Hot Spots, which remain on the board even if the fire on their square is extinguished and cause the fire to spread throughout the house in unexpected ways. Even more impressive is that the setup for an “Experienced Game” is randomized, so every game you play will start with the starting fires, Hot Spots, Hazmats, and POIs in different areas of the house. Suffice it to say, this adds considerable replay value to what could easily become a rather humdrum affair once you’ve mastered the skill of firefighting. Um- the sofa’s caught fire. Let’s step outside for a breath of fresh air, shall we? Ah, that’s better. As we await the inevitable destruction of my home and admire the view from out here, let me give you some final thoughts. Flash Point has some really great things going for it. The design is simple and uncluttered, there is fantastic amounts of replayability, the content is quite family-friendly, and so long as you are playing the “Family Game” the rules are simple enough that a child can not only learn them, but start to master them after a few games. This is a fantastic option for people who need a game to use to introduce non-gamers to the hobby, what with the cooperative aspect and the straightforward and easy to remember rules. This is a prime example of a game that is easy to learn but tricky to master. For all of these reasons, A Space Ahead heartily recommends that you add this fiery gem to your collection.